People tell us all the time that if they need to be in hospital, they want to be at Queensway Carleton Hospital. That’s because we are focused on healing people. We’ve built our reputation as one of the region’s leading acute care hospitals by seeing the person in each of the nearly 500,000 patients who come to us each year. Our agility and collaborative culture allow us to respond quickly to today’s pressing healthcare challenges by investing in advanced programs and services that put the person at the center of patient care. Queensway Carleton Hospital is home to Ottawa’s busiest emergency department with more than 80,000 visits per year, the Myers Automotive Acute Care of the Elderly (ACE) Unit for seniors – one of only two in Ontario that are transforming geriatric care – and is a leader in people-centered advances in orthopedic surgery. Located in fast-growing west Ottawa, Queensway Carleton Hospital helps to create vibrant and healthy communities that we can be proud to call home. 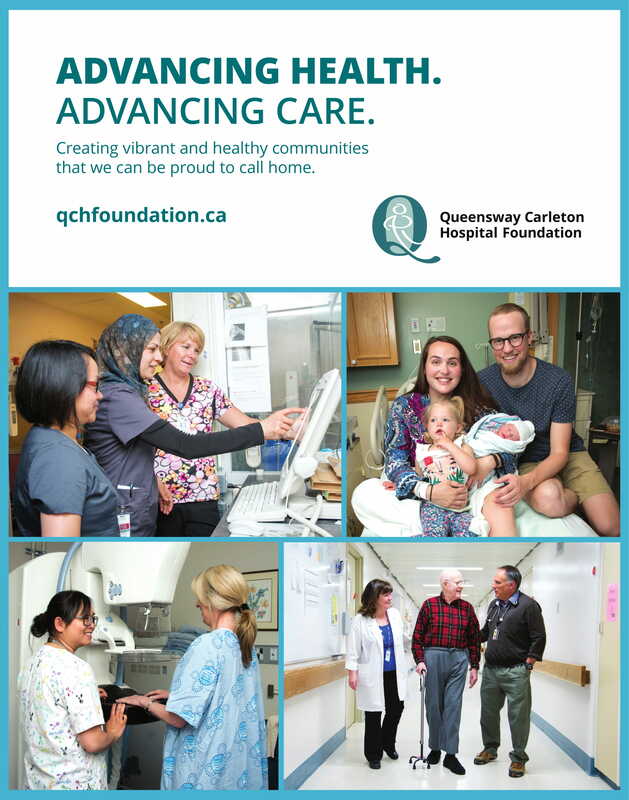 By supporting Queensway Carleton Hospital Foundation, you are investing in advanced patient care and healthcare excellence for our community. Advancing Care for All Ages is a $30-million campaign to enhance the delivery of care for patients at Queensway Carleton Hospital. Your generosity is an investment in continuing healthcare excellence at our hospital. Currently our focus is to transform our mental health unit to provide enhanced care through the Hopes Rising Campaign. Queensway Carleton Hospital has seen a 46 per cent increase in admissions to our 40-year-old unit. Our community goal of $5 million will allow our planned 7,000-square-foot expansion and renovation to provide a welcoming, tranquil and healing atmosphere and improved emergency care for people in the midst of a mental health crisis. Mayor Jim Watson, showing his support of Mental Health at Queensway Carleton Hospital at the Hope Blooms at the Farm Gala in May 2018. Funds raised will enhance acute mental health services for adults of all ages at Queensway Carleton Hospital as part of the Hopes Rising Campaign. Volunteers play a key role in helping Queensway Carleton Hospital Foundation achieve its mission, and we are grateful to receive support from volunteers throughout the year in a variety of different ways. There are a number of volunteer opportunities available, including board, committee and advisory group roles, as well as fundraising event support, hospital volunteer roles and opportunities to act as ambassadors in the community on behalf of the Foundation. HOPES RISING is a $5-million campaign to enhance and improve mental healthcare for a rapidly growing number of adults and families in our region. It is a campaign inspired by the hopes of families throughout our community to enhance acute mental health services for adults of all ages at Queensway Carleton Hospital. Queensway Carleton Hospital Foundation is currently raising funds to purchase a new 3D mammography unit to allow for more accurate breast cancer screenings and earlier diagnosis. The Queensway Carleton Hospital MAMMOGRAPHY CAMPAIGN is raising $800,000 to purchase a new mammography unit for the hospital. The new 3D technology will allow for more accurate breast cancer screenings and earlier diagnosis. Queensway Carleton Hospital plays a key role in the Ontario Breast Screening Program, running 7,500 mammograms per year. Queensway Carleton Hospital Foundation is the only accredited hospital foundation in the Ottawa region under Imagine Canada’s National Standards Program. This accreditation demonstrates to our community that our Foundation is a leader in best practice governance and donor accountability.